Michael Bennett during a game against the Atlanta Falcons, Thursday, Sept. 6, 2018 at Lincoln Financial Field. The product on the field is gruesome enough, as the Eagles have seen two big plays on offense called back due to questionable penalties. They've also, you know, stunk on defense. Early in the second quarter Michael Bennett was slow to get up after a play deep in Giants' territory. A few minutes later he was seen entering the Eagles tunnel for the locker room — instead of the medical tent on the sideline. Reports suggest that he was walking quite gingerly, and the Eagles announced that he is questionable to return with a foot injury. 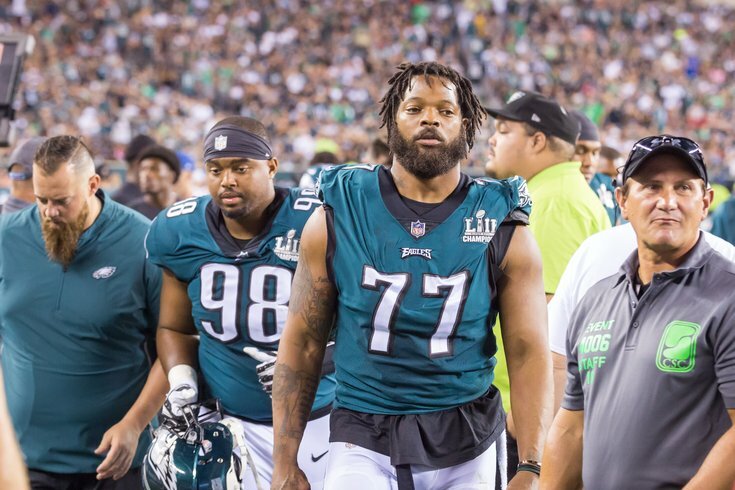 Bennett was one of the few healthy members of the Eagles' bruised and battered defense, it seems and the defensive line now stands nearly as shallow on depth as the cornerbacks group. Michael Bennett went indoors. #Eagles down to three DEs -- Brandon Graham, Chris Long, Josh Sweat -- currently. 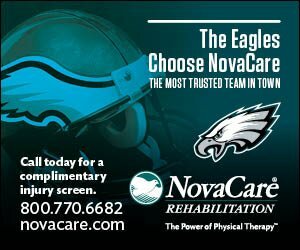 Two other Eagles were officially added to the injury list in the second quarter — running back Josh Adams (shoulder) and offensive lineman Brandon Brooks (ankle). Each was listed as expected to make a return. Bennett did return to the field in time for the Eagles' last defensive drive of the first half — a good sign, especially knowing that he could have simply waited until halftime with just 56 seconds to play when he returned to the field. Check back for more injury updates later in the second half.